KNS register 1919 has sH33 “Rocambole”, Anker & Jensen 1919, owner J.A.Jespersen, Kristiania. KNS register 1919 has sH31 “Sans Souci”, Anker & Jensen 1918, owner Chas. W. Scappel, Kristiania. KNS register 1920 has sH33 “Rocambole” ex “Sans Souci”, Anker & Jensen 1919, owner J.A.Jespersen, Tönsberg. KNS register 1920 has not separate listed sH31 “Sans Souci”. Technical data corresponds with Johan Ankers design of 1917. This indicates that sH31 has become sH33 laid down in 1918 and launched in 1919. 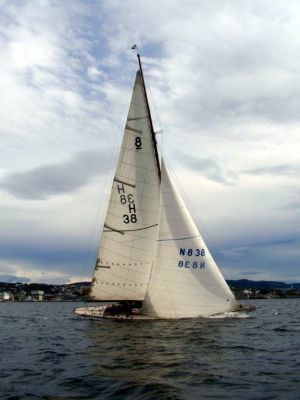 In 1920 she is converted to the new R-rule of 1919 with racing sail no. 8N4. Seilas yachting magazine of July 7th 1920 reports that “Rocambole” (new) by Jens Beckmann, Tönsberg is sold to Mrs. Emma Jespersen, Tönsberg. 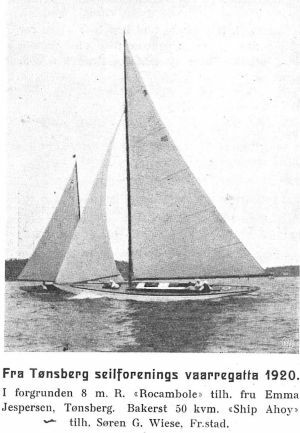 KNS summary of races in 1920 reports in the 8mR(new) Class, “Rocambole” with owner Emma Jespersen, Tönsberg. 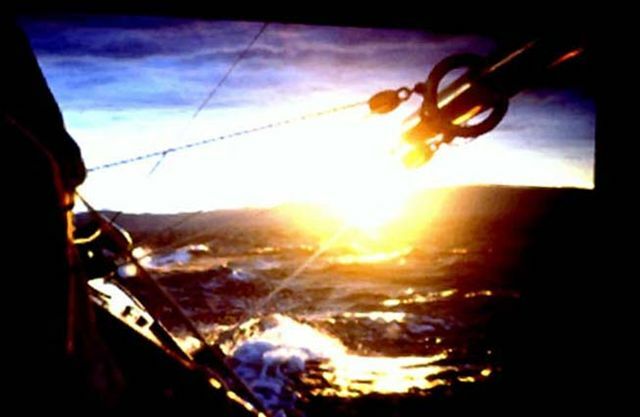 Among the other contenders are “Sildra” with owner J.A.Jespersen, Tönsberg, “Verano II” owned by Eilert Sundt, Kristiania and “Trolljo III” owned by Gunnar Rabbe, Kristiania. Racing sail no’s in 1920: 8N2 “Sildra”, 8N4 “Rocambole”, 8N11 “Verano II”, 8N17 “Trolljo III”. It seems that J.A.Jepersen replaced “Rocambole” with Ankers new design 8N2 “Sildra” who in 1920 won gold medal in the 8mR (new) Class at the Antwerpen Olympics. Seilas no 2 of Jan. 26th 1921 reports that 8mR “Rocambole” by Emma Jespersen, Tönsberg is sold to Sverre Gulbrandsen, Kristiania. KNS register 1921-22 has “Revanche”, ex “Rocambole” , ex “Sans Souci”, Anker & Jensen 1919, owner S. Gulbrandsen, Kristiania with racing sail no.8N4. Seilas 1922, page 95 reports that 8mR “Revanche”, is sold by S. Gulbrandsen, Kristiania to Gunerius Pettersen jr., Kristiania. KNS register 1923-24 has not listed sH33. KNS register 1923-24 has listed sH31 “Trolljo III”, Anker & Jensen 1919 owner Gunnar Rabbe, Kristiania. Listed overall length is however 13.81 m which does not correspond with the in KNS register of 1919 listed sH31 “Sans Souci” (overall length as new 13.73 m). sH31 “Trolljo” is not the same yacht as sH31 “Sans Souci” = sH33”Rocambole”. KNS register 1925-26 has listed sH31 “Trolljo III” but not sH33. KNS register 1927-28 has neither listed sH31 nor sH33. Seilas no 23, 1927, page 180 reports that “Revanche”, with owner R.Arentz-Hansen, is racing in handicap class (N.L. Class II). Seilas 1929 page 135 reports that “Revanche“ 8m(old) by Hans R. Larsen, Oslo is sold to Ludvig Svinndal, Oslo. KNS register 1929-30 has listed sH33 “Ilmen III”, ex “Revanche, ex Dudu, ex Sans Souci, ex Rocambole, Anker & Jensen 1919, owner Ludvig Svinndal, Oslo. KNS register 1931-32 has sH33 “Ilmen 3” with owner Sigurd Steen, Oslo. Seilas 1934, page 88 reports that “Hai 2”, 8mS by Peter Petersen, Oslo is sold to Carl D. Lövenskiold, Sandvika. Her new name is “Hennessy”. KNS register 1933-34 has sH33 “Hennessy”, owner Carl O Lövenskiold, Oslo. KNS register 1935-36 has sH33 “Hennessy”, owner Carl O Lövenskiold, Oslo. Seilas no.11, 1938, page 83 has 8m "Aku", with owner Hans Gude, harbour at Langvik, KNS, Oslo. Lloyds Register of Yachts 1952 has Rocambole with name Bé-Bé (ex Agu, ex Hennysi, ex Hai II, ex Ilmen III, ex Revanche, ex Dudu, ex Sans Souci, ex Rocambole) constructed at Anker & Jensen in 1919. Owner 1952 is B. Brynildsen jun., Moss. KNS register 1951 has sH33 “Terna 4”, owner Johs Brunäs, Oslo. Her sail area is cut back to 67 m2. KNS register 1954 has sH33”Terna 4”, owner Johs Brunäs, Oslo. Her sail area is cut back to 62 m2. KNS register 1956 has sH33“Terna 4”, ex Aku, ex Revanche, ex Dudu, ex Rocambole, ex Sans Souci, ex Hai 2, ex Ilmen 3, ex Hennesy., owner Johs. Brunnäs, Bekkelagsh. KNS register 1958 has H33 ”Senta” ex “Terna 4”, owner Rasmus Larsen, Porsgrunn. The registers indicate that a swop in racing sail no has taken place such as sH31 “Sans Souci” (1918) becomes sH33 “Rocambole”(1919) converted in 1920 to 8N4. Sail no. sH31 is later in 1919 given to 8mS “Trolljo” (1919) converted to 8N17 in 1920, ref. Data-sheet sH31.